[S1602] Chicago Tribune, April 8 2012, page 31, Proquest, accessed June 8, 2012. [S2545] Interview, Joseph R. Sullivan, November 9, 2017. [S2546] Chicago Tribune, October 8, 2017, online. WIlliam J. Brander, age 78, beloved husband of Sue A., nee Sullivan, for 53 years; loving father of William J. M.D. (Victoria, M.D. ), Elizabeth, Michael (Dawn), Mary Cassara, Daniel (Jennifer), Kathleen, Thomas (Pamela), Margaret, James (Peggy), Patricia (Daniel) Elster and Jean (Kevin) Masukevich; proud grandfather of 26; and great-grandfather of two; dear brother of Jeannette Masek; loving son of the late William J. and Ida M. His life is marked by many accomplishments. Most notably, he was an Eagle Scout, the valedictorian of St. George HS Class of '51, an American Contract Bridge League LIFE MASTER, a US Naval veteran and a member of the Barbershop Harmony Society (aka SPEBSQSA) for 58 years. Visitation at Cooney Funeral Home, 625 Busse Hwy., Park Ridge, Monday from 2 to 9 p.m. Funeral, Tuesday 10:45 a.m. to Immaculate Conception Church. Mass at 11:30 a.m. Interment All Saints Cemetery. In lieu of flowers, donations to Christian Brothers of the Midwest, 7650 S. County Line Rd., Burr Ridge 60527 or Rainbow Hospice www.rainbowhospice.org would be appreciated. Death*: John D. Brankin died on 6 March 1950; BRANKIN - John D. Brankin, beloved husband of Marguerite, nee Hoy; fond father of Mrs. Marie Moulder, brother of Thomas, James, Edmund and the late Francis. Funeral Thursday, 10 a.m., from chapel 4245 W. Madison, to St. Mel's church. Interment Calvary. Member of A. L. Elec. post, No. 769. [S1407] Chicago Tribune, November 22, 1951, page H10, ProQuest Historical Newspapers, Chicago Tribune (1849-1987), accessed June 1, 2011. 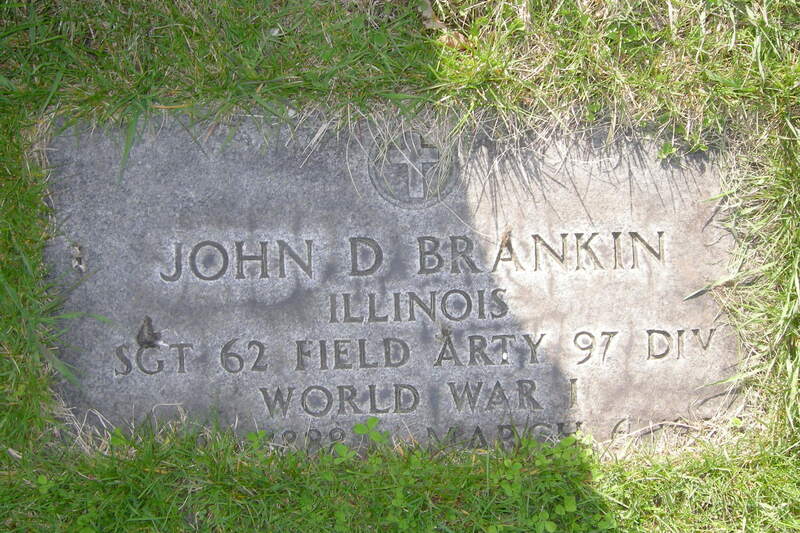 [S2070] John D. Brankin Cemetery marker, Calvary Cemetery, Evanston, Cook County, Illinois, USA. [S1422] Cook County, Illinois Marriage Indexes, 1914-1942, online www.ancestry.com, John D. Brankin and Marquerite Hoy, record # 0886351. [S86] Richard Brankin, birth certificate number 6011562/death certificate number 6008201; accessed May 3, 2015, Bureau of Vital Statistics, Cook County Clerk's Office. [S2103] Illinois, Cook County Deaths, 1878-1994, online www.familysearch.org, Richard Edward Brankin, born 13 March 1926, died 17 March 1926 in Chicago, Illinois. Certificate #8201. Accessed FamilySearch.org, January 9, 2018. [S2604] Bridget Brophy, Ireland, County Queens, Mountmellick, Rushin birth registration Page 660, line 189; ID# 02245008, Accessed Bebruary 11, 2018 (May 1, 1869). [S2602] John Brophy, Ireland, County Queens, Mountmellick, Rushin death registration, Accessed February 7, 2018. [S2594] Marriage record: entry for Joseph Dooley and Elizabeth Brophy, November 1, 1883 IrishGenealogy.ie, Department of Arts, Heritage and the Gaeltacht, Ireland, Accessed February 7, 2018. [S2594] Marriage record: entry for Joseph Dooley and Elizabeth Brophy, November 1, 1883 IrishGenealogy.ie, Department of Arts, Heritage and the Gaeltacht, Ireland, Accessed Fevruary 7, 2018. [S2605] Bridget Glennan Brophy, Ireland, County Queens, Mountmellick, Cloniss death registration, Accessed February 11, 2018. [S2607] Elizabeth Dooley, Ireland, County Queens, Mounthmellick, Dencullen death registration, Accessed February 11, 2018.